On July 20-22, Silverstone will be summoning vintage cars from all over Europe to it's famed track for the Silverstone Classic event. Once again, the AOC will be there in full force and are hoping to have 20+ cars in their corral. 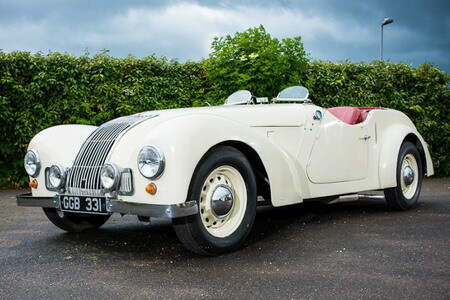 In addition to some great racing, club parades, and general car watching, Silverstone Auctions will be selling an interesting Allard. M-type #321 is pretty interesting. It was originally sold as a chassis only through dealer George & Jobbing on November 7, 1947. From there, we assume the car sat around for a few years unfinshed. 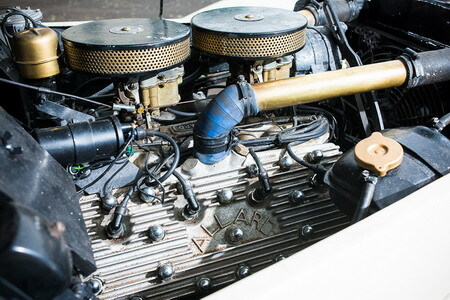 At some, the car must have been sent back to the factory to be completed, including: a hybrid M & K body, coil spring front end conversion (these did not appear until late '49), and a 24-stud Mercury V8 was added with Allard heads & intake. The car was originally owned by BBC broadcaster Randall Herley and has only had two owners since. The car is listed as lot #110 and is estimated to sell for 20-25,000 GBP ($31-39,000). To learn more about the car and see additional photos, click here or on the photos above.